Kyphosis is a postural syndrome of the upper back and neck where the shoulders appear rounded and the upper back hunched. We examine the causes and treatment options. Serious Kyphosis where the spine is significantly deformed will require medical treatment. We focus on Kyphosis as a result of poor posture and muscle imbalances. This type of Kyphosis may be corrected with postural awareness and exercises. Kyphosis is a postural syndrome of the upper back and neck. Typically the upper back appears curved with rounded shoulders, the scapula (shoulder blades) are protracted (positioned further away from the spine) and the chin pokes forwards rather than being tucked in. This occurs in all sections of the population. In the sports world, cyclists and baseball catchers are at risk as they have to hold postures for long periods as well as the amateur bodybuilder who overdevelops and tightens the pectoralis (chest) muscles neglecting the muscles in the upper back. Cervical posture syndrome is sometimes also called upper crossed syndrome. 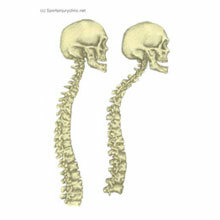 This is due to the muscle imbalances which are present in this type of posture. For example, the pecs and posterior neck muscles are tight and the muscles of the upper back and deep neck flexors are weak. If you connect the two tight muscle groups and the two weakened muscle groups with two straight lines, they form a cross shape, giving the condition its name. The muscles at the back of the shoulders and upper back (trapezius, latissimus dorsi, and rhomboids) are weakened and stretched. In particular, the sternocleidomastoid muscle is tight and shortened causing the jaw to be protruded forwards. Massage to the upper back and neck can reduce pain and tension in the tight muscles. Massage and stretching techniques for the sternocleidomastoid muscle in the neck. Strengthening exercises for the muscles at the back of the shoulders. This taping will encourage correct posture of the upper back and neck and so will aid in the rehabilitation of neck pain. The following guidelines are for information purposes only. We recommend seeking professional advice before beginning rehabilitation. This taping will encourage correct posture of the upper back and neck and so will aid in the rehabilitation of neck pain. You will need one roll of 1.5 inches (3-4cm) or similar zinc oxide tape which is nonelastic. If you have a very hairy back you may need to shave to prevent discomfort when removing the tape -also to provide a better surface for the tape to stick to. Use this taping technique in the early stages of rehabilitation to encourage good posture and take some stress off the back. Do not rely on it long term as this will lead to muscle weakness. Stand or sit in an upright position with shoulders back. Place one strip of tape from the bottom of the neck, down the back, pulling gently downwards when applying the tape. Place another strip of tape the other side of the neck in the same way. Repeat this process on the first side coming from the front of the shoulder down the back. Repeat step 3 on the other side of the back to complete the process. This taping technique will aid in posture correction and help temporarily take the strain off the upper back and neck. Use in the short term for pain relief and to assist in educating about maintaining the correct posture. Avoid using it for more than a few days as the athlete may get to rely on it and muscles may start to weaken.